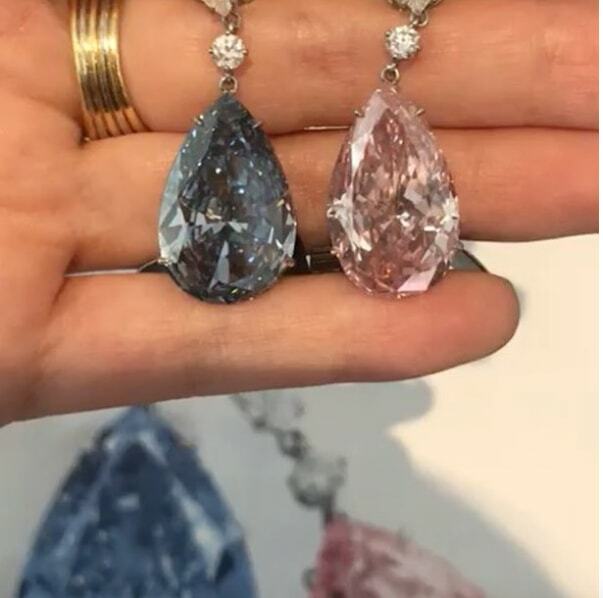 In super pretty, sparkly things news, a pair of diamond earrings just sold at Sotheby’s for $57.4 million! That makes them the most expensive earrings in the world. Even crazier, they’re not technically a matching pair. Named Apollo and Artemis after the Greek gods (because, yes, of course they have names), they’re made from separate diamonds. Apollo is a rare blue diamond, and Artemis is a rare pink diamond. As if that weren’t strange enough, they aren’t even the same price! Apollo is rarer, so it went for over $42 million while Artemis went for $15 million. Talk about a sibling rivalry! The two earrings were reportedly put up for sale separately. While this might sound weird, it actually makes sense. Together they’re so expensive that no one thought a single buyer could afford them both. Despite the price, the same buyer did end up buying them both. Which just goes to show, never underestimate people’s love for shiny things! But most importantly, the earrings are so sparkly and fun to look at. Apollo also has a rare rating of 11b which puts it in the top 1 percent of highest grade diamonds in the word. Artemis earned a 11a rating which and Sotheby’s lists as “the most chemically purse” of its kind. In other words, this pair is one-of-a-kind! So congratulations to the lucky buyer, whoever they are. We hope you are enjoying the greatest diamond earring purchase of all time. Please take some amazing selfies with your new pair of beautiful diamond earrings, so we can enjoy their beauty, too!